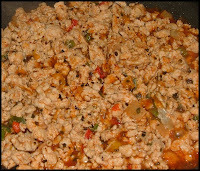 In a large skillet, cook the ground chicken and pepper/onion blend until the chicken is no longer pink, breaking up any large chunks of chicken. Add the Splenda, tomato sauce and seasonings. Continue cooking until any liquid is cooked out and the sauce has thickened just a little bit. I only added 1 packet of Splenda, but if you think it needs more, add another 1/2 to 1 packet. This is good on a bun, over a potato, rice, on a salad, or anything else you can think of.